d: dunno. what do u think? d: had pasta for lunch. chili? m: S#%T !!!!!! sue just called a 5:00 mtg. prob on 6:27 w/ u. When Remote Dinner Paralysis* strikes, you can do one of two things: You can browse all those recipe Apps you bought for this very occasion yet somehow never remember are there. Or you can call home and ask whoever answers (babysitter, 8-year-old, sock monkey) to complete a so-easy-even-a-sock-monkey-can-do-it task: put a pile of baking potatoes in the oven then turn the heat to 450°F. And then — Sue, be damned — you can still have family dinner on time. *i.e. you can’t think of any ideas for dinner, and you are too far away from the kitchen to open up the fridge, poke around the pantry, flip through your TFD for inspiration. 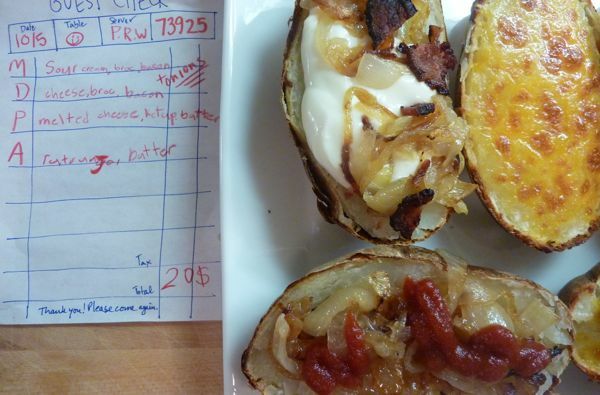 P.S: I drew some very JV-looking “Guest Checks” for a game of restaurant over the weekend, but Phoebe decided they’d be put to better use in the real kitchen. She took our toppings orders and made sure everything matched up. Oh what a GREAT idea for nights when hubby is out and its me and the babe and 17 yo. 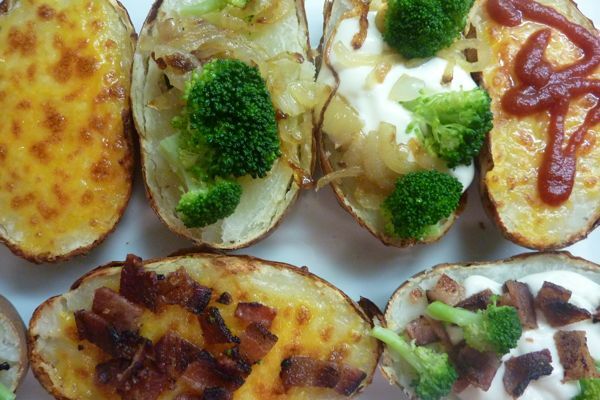 One of my favourite meals is a baked potato bar! We eat it when we have a little bit of a lot of different foods hanging around in the fridge. I totally do this- Baked potatoes are my ‘rabbit out of a hat’ trick. I’ve even been known to microwave a few spuds in a pinch (scandalous yet edible). I always have chili in the freezer making ‘Chili-Cheese Baked Potatoes’ a pretty popular meal around here. So nice to have a successful dinner on a crazy night. I love this blog. You’re simultaneously realistic and inspiring- a rare combo. OMG. Those potatoes look so good! I call TJ’s waterpacked sardines “butterfish” so the girl will eat them, spine removed, of course! what did Abby “order” on hers? rutburger, butter? i can’t read Phoebe’s handwriting! (and yes, i zoomed in.) And foil-wrap, or not foil-wrapped? i’m totally making this some night this week. p.s. i love that the table number is smiley-face! that’s DALS in a nutshell. when we are in a bind we do quessadillas. I’m so sick of quessadillas. I kind of hate them, actually. My son won’t eat potatoes but I will! This is a such a simple and smart idea…the kids will love picking their toppings as if it were pizza! Very new to the blog. Just wanted to say (a little off topic), that we do potato bar a lot, except I make the potaotes in the crock pot. Poke potatoes; wrap in foil; cook on high for 4 hours. 13-yr-old puts them in when he gets home from school. Love the topping ideas! I’ll steal those for sure. Thanks for the reminder. We used to do this, but I had forgotten recently. We had it tonight and it was deemed “the best meal of the last 2 months”! I also offered: chopped green onions (my kids are pre-teens and starting to appreciate these), diced fresh tomatoes, sliced black olives, and a can of black beans drained and warmed with a little salsa. Yum! Thanks for your inspiring website. we do this too, but we top with cottage cheese and salsa. ridiculously easy and everyone eats tons from baby to 4yo twins to mom and dad. one of our best dinners when there is no time for cooking! Love it! When we’re in a pinch and don’t have enough time to bake whole potatoes, I chop them in small piece, toss the, with oil, salt and some pepper, and bake at 425 for half hour. It’s irresistible topped with cheese or served next to broccoli! Hilarious! Do you live in our house or somehow have access to our texting records? Love it.